Your front porch is one of the first things people see when approaching your home. That’s why it’s important to spice it up and give it some personal flair. It’ll improve your home’s curb appeal and will also be a relaxing place to hang out on warm summer days. 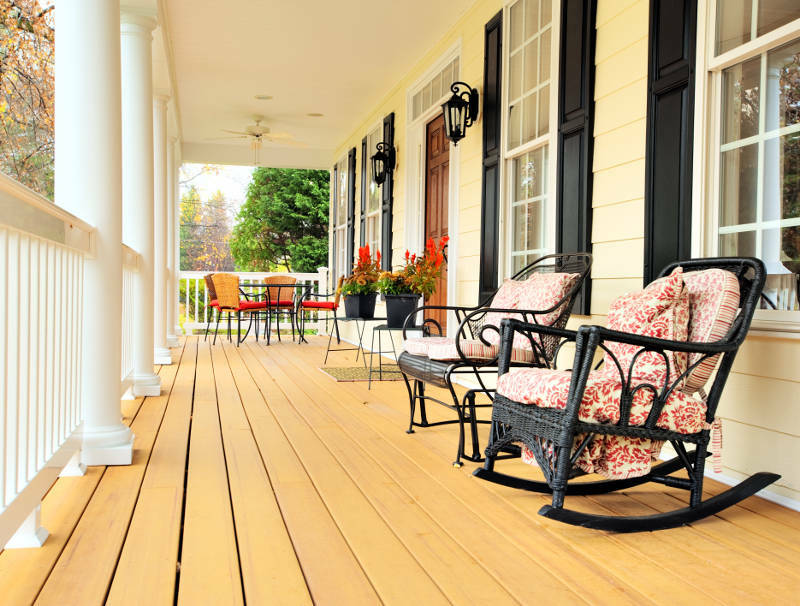 With all of the ways you can enhance your front porch, it’s hard to know where to start. Don’t worry though, we’ll help you with these 10 cool front porch ideas for your Madison home. Your front porch can become an extension of your home. So why not add a little furniture? It’ll give you a great place to sit and read or hang out with guests. Either way, it’s a wonderful area to relax. 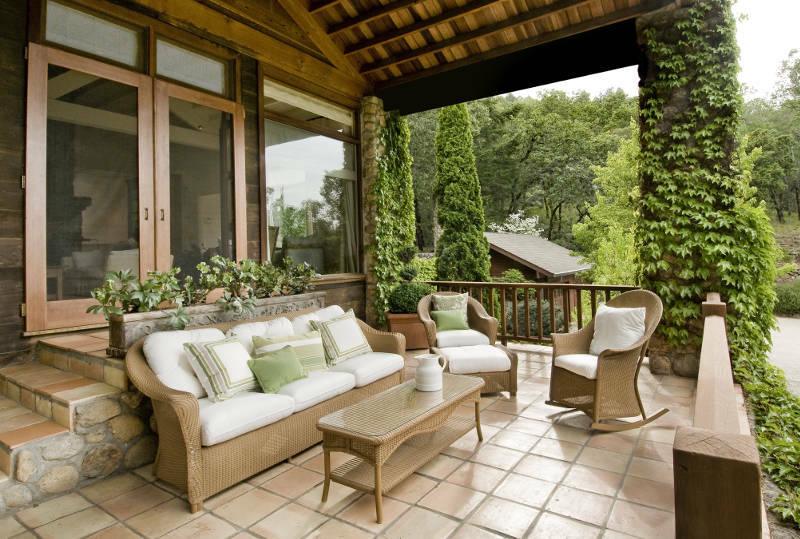 There are many different options for furniture that are great for a front porch. Benches and rocking chairs are common pieces homeowners use, but there are many other options such as patio sets, papasan chairs or swinging benches. There are different material options as well. You can get metal, cloth or even wicker. Be careful though, if you don’t have an awning over your porch, your furniture will get wet. You’ll either need to find furniture that can withstand the weather or you’ll need to bring it inside when a storm is coming. Flags are an easy way to show pride in something you enjoy. You can change your flag out for each holiday or different sports season. It could reflect your heritage, your favorite sports team or the American flag. Not Matter which flag you display, it adds a bit of personal touch to your front porch. 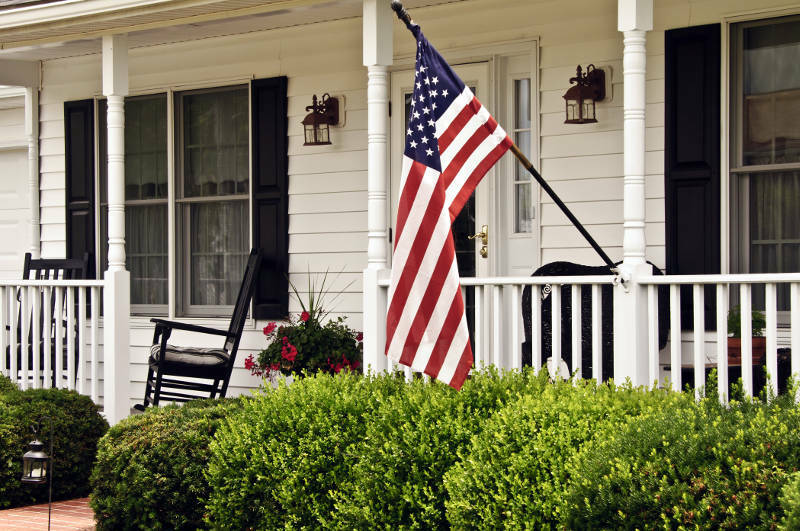 Adding a flag to your front porch could be fun! As someone approaches your front porch, what’s the first thing they’ll see? Obviously it’s your entry door. Make that first impression a good one with a new, elegant entry door. It’s sure to improve the look of your porch and your home’s curb appeal. The benefits don’t stop at your front porch. 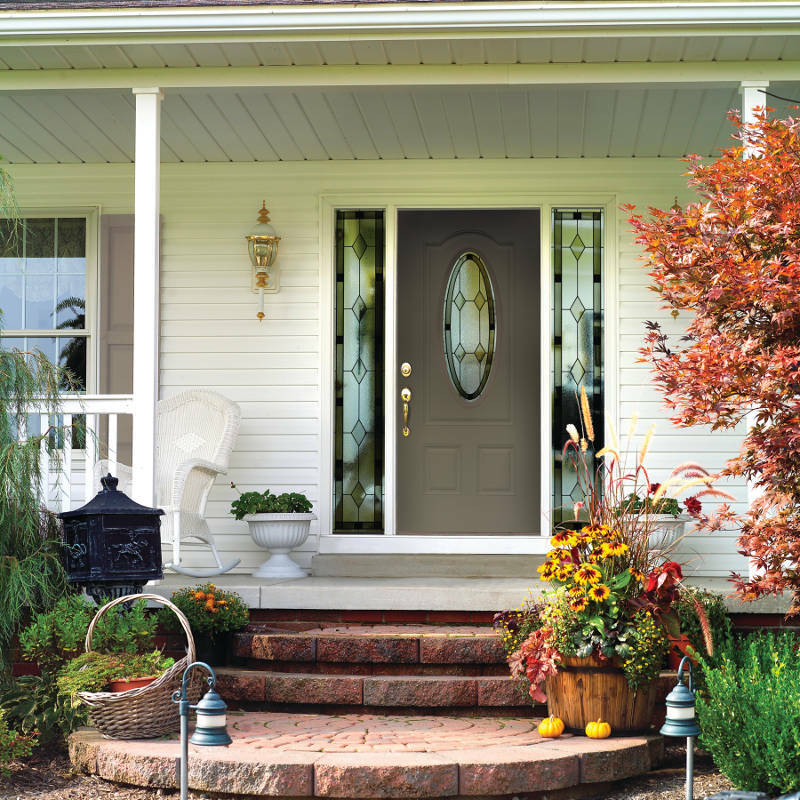 The rest of your home will benefit from a new entry door. It’ll increase your home’s energy efficiency and lower your utility bills. A new entry door will improve your entire home. Many front porches already have rails and banisters, but it’s still worth mentioning. They create a distinct barrier between you and the rest of the world without completely shutting yourself out. It also makes the area feel more intimate. Not to mention they add a decorative touch to your front porch. You can’t go wrong by adding rails and banisters to your front porch. A little greenery can go a long way. 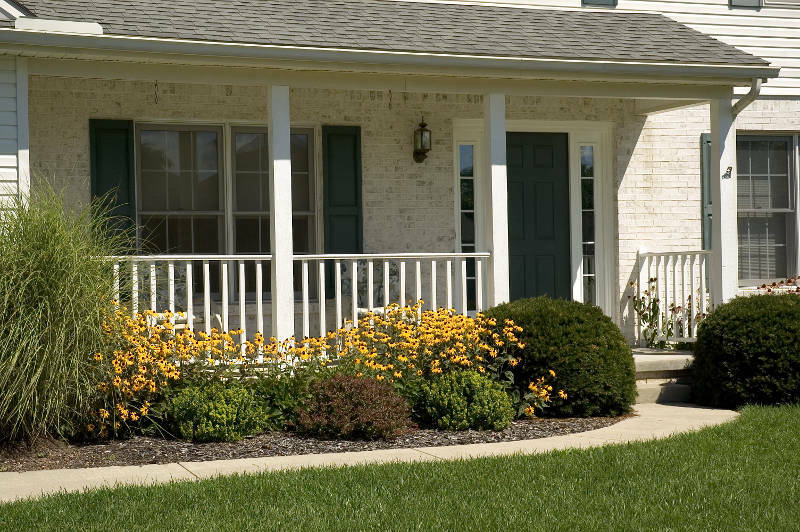 Plants and flowers give your front porch a more lively, cheerful look. They’ll also get direct sunlight from being outside so they’ll thrive – just don’t forget to water them. That being said, don’t get plants for the sake of getting plants. Overloading your porch with them will negate their appeal. Also you should get a plant that matches the style of your porch. Whether you choose floor plants or window boxes filled with flowers, you’re sure to create a welcoming look. Adding a little light to your front porch will do wonders. It’ll allow you to enjoy your porch at night an even ward off intruders. 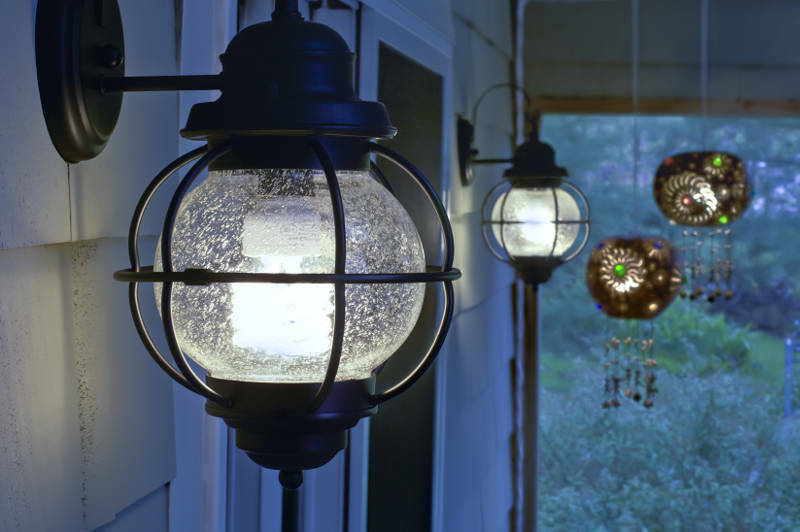 There are many fun ways of lighting your front porch. The most common way is through decorative lights. You can have them turn on with a light switch or a motion sensor. There are different size and color bulbs to change the feel of the area. Don’t get too crazy with the the color of the bulb though, it could take away from the look of your front porch. Another thing you could do is add small torches around the area. This isn’t something recommended year round, but it could add a bit of festivity during the summer months. Not everything has to be elaborate. The addition of a decorative doormat is a minor change that could majorly spice up your front porch. There are an infinite number of patterns and designs you can choose. You’re sure to find one that will match your style. If by some miracle you can’t find a doormat you like, you can resort to making one yourself. There are simple tutorials online that will show you what you need in order to make the perfect doormat. So now any design you can imagine, you can make. Wreaths aren’t only for the winter. You can hang one during any holiday or season. They’re a great way to add a simple decoration that injects some personality into your front porch with a pop of color. 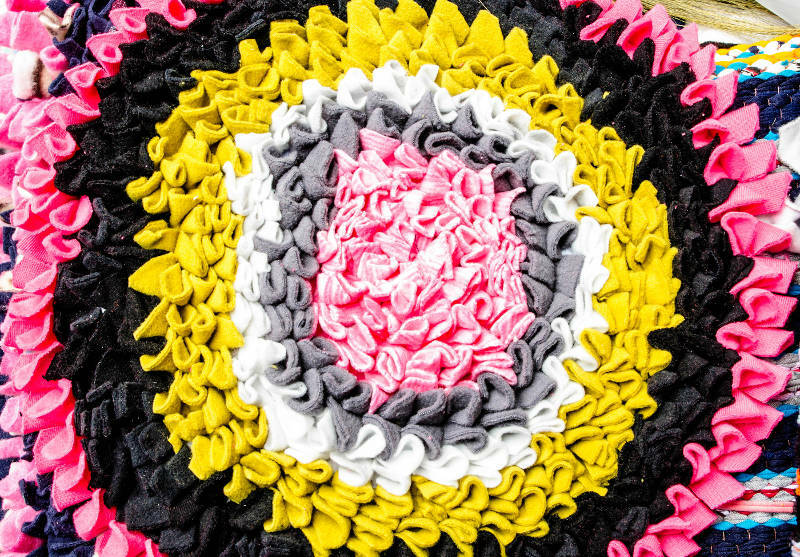 If you want to have more fun, you can make your own wreath. This will give you the opportunity to add your personality to the wreath. You’ll dress up your front porch and impress your guests with your arts and crafts skills at the same time. Sounds like a win-win situation. 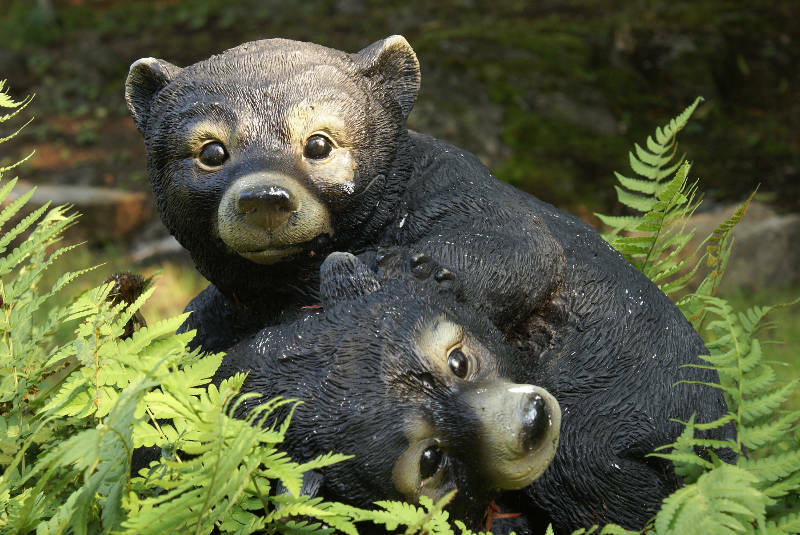 Statues can be an interesting addition to your front porch. They can be anything from an animal to a religious figure to a gnome. They’ll says a little bit about you. That being said, be careful. Don’t pick something extremely obscure or one that doesn’t fit your personality. And you don’t want to be that house with an excessive amount of statues – so use restraint in your usage. 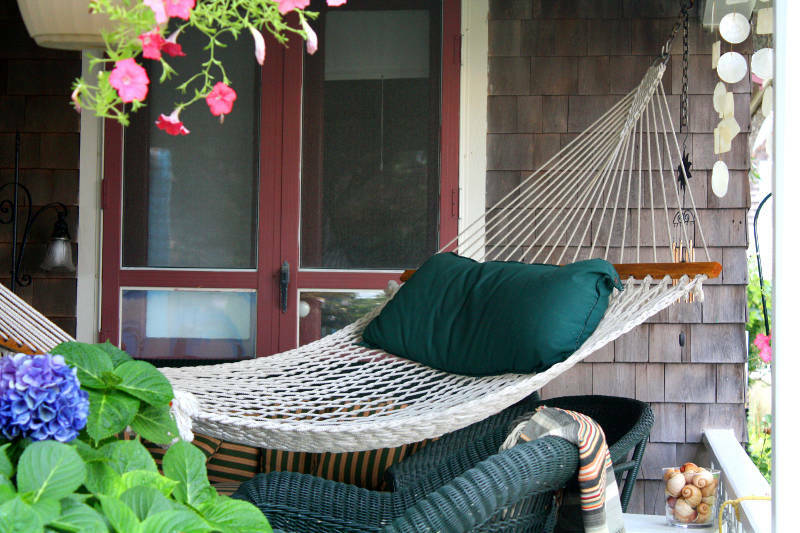 If you have enough space, one fun, relaxing thing you can add to your front porch would be a hammock. Nothing’s better than laying around reading a good book. Why not do that on your front porch and enjoy a cool summer breeze? When it comes down to it, there are no right or wrong ideas for decorating your front porch. It depends on what makes the perfect porch for you. Pick and choose what will improve your home’s curb appeal, be something that would be a useful addition to you and something that shows off your style. 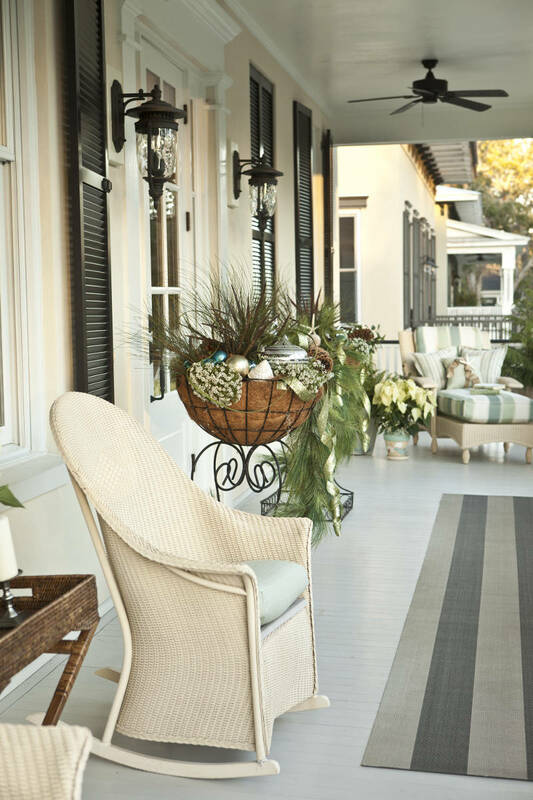 With these 10 ideas, you can start designing the best front porch for you. Maybe we even sparked a few additional ideas. Hopefully it helps you design a cool front porch that you’ll love.